As a kid I was fascinated with stairs (and books, obviously). I guess they raised my curiosity, always seeming to lead to a mysterious place. The house I grew up in had three sets of stairs and I clearly remember falling down each of them. My dad tells me that when we first went to look at the house to possibly purchase it, I was all of a year old and I headed directly for the stairs. 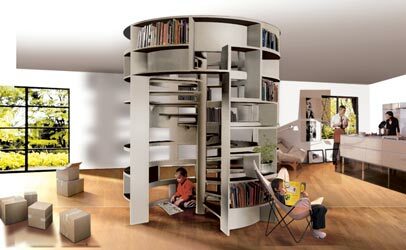 When I came across this design for a bookshelf combined with stairs it caught my imagination. I envision it filled with books, and at the top a cozy cushioned nook in which to disappear for hours.